We are proud and happy to inform you about the Grand opening of the Nelson Mandela bridge in Alkmaar, the Netherlands, this Friday 12 February. The largest movable road bridge of fibre reinforced polymer (FRP) in the world! 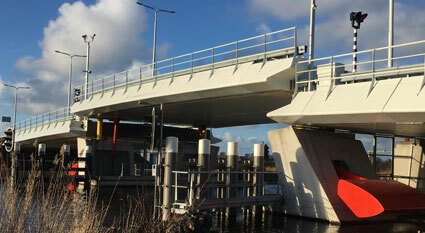 On February 12, the Nelson Mandela bridge in Alkmaar will be officially opened. This festive opening will take place at the bridge from 15:30 pm NL time. The Nelson Mandela bridge connects the Beverkoog Business Park in Alkmaar with the city of Heerhugowaard. The new bridge is a so-called ‘Table bridge’, whose movable middle section is lifted. This movable part is made of fibre reinforced polymer and is 22.5 meters long. It is the largest movable bridge in the world of fibre reinforced polymer suitable for all types of motorized traffic. International engineering and project management consultancy Royal HaskoningDHV is responsible for the architectural design and the extensive knowledge of fibre reinforced polymer in the infrastructure. More information: the bridge has been designed by Joris Smits and Sven Spierings of Royal HaskoningDHV. KuiperCompagnons and Royal HaskoningDHV were engaged in the very prestigious project to produce a strategy for the development of the River Warta in Poznan, Poland. The final recommendations resulting from the strategy and vision for the river development were presented by the municipality of Poznan. New airport terminal for 43 million passengers annually in ultimate phase. Taiwan Airport Company has awarded a EUR 33 million consultancy contract for the development of Terminal 3 Area at Taiwan Taoyuan International Airport (TTIA) to a joint venture of NACO, T.Y. Lin and Parsons Brinkerhoff. NACO Netherlands Airport Consultants, a Royal HaskoningDHV company, is the lead consultant in the joint venture. Services will be provided for seven years.